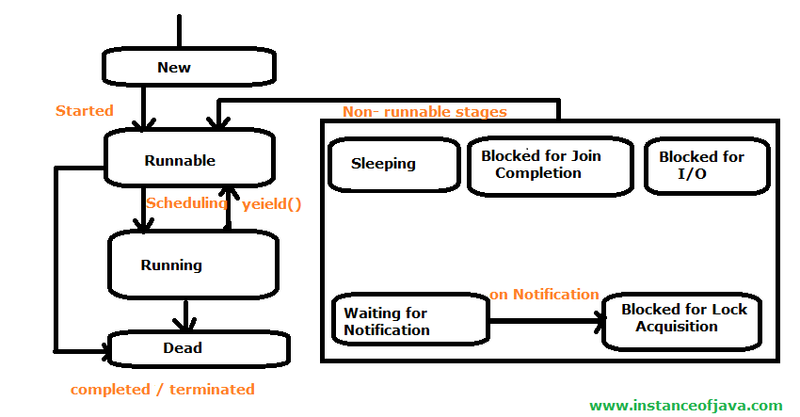 Its recommended to learn about life cycle of Thread before you start programming on Thread. Threads exists in different type of states. A thread has been created but not started yet. A thread will be started by calling its start() method. This state is also called ready to run stage also called queue. A thread starts in runnable state by calling start() method. The Thread scheduler decides which thread runs and how long. If a Thread is executing that means Thread is in Running stage. Once a Thread reached dead state it can not run again. A Running Thread transit to one of the non runnable states, depending upon the circumstances. A Thread remains non runnable until a special transition occurs. A Thread does not go directly to the running state from non runnable state. But transits first to runnable state. Sleeping: The Threas sleeps for specified amount of time. Blocked for I/O: The Thread waits for a blocking operation to complete. Blocked for join completion: The Thread waits for completion of another Thread. Waiting for notification: The Thread waits for notification another Thread. Blocked for lock acquisition: The Thread waits to acquire the lock of an object. JVM executes the Thread based on their priority and scheduling. Schedulers in JVM implementations usually employ one of these two Strategies. JVM will assign a priority for every Thread created in it. A thread inherits the priority of its parent Thread. The default priority of the every thread is normal priority 5, because main thread priority is 5. User defined thread created with default name Thread+<index>, where index is the integer number starts from 0. The name of a thread can be change using setName(String name) method. Get by using getName() method.